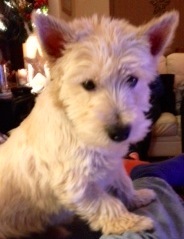 Unfortunately the popularity of the Westie has encouraged widespread indiscriminate breeding for profit which has resulted in some diseases, once rare, becoming much more prevalent. We have listed the more common diseases here. 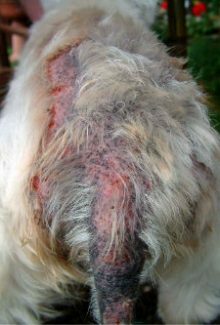 Skin problems in westies are very common and can develop at any age, sometimes mild and easily managed, or the problem can be extensive, particularly if left without treatment. Atopic Dermatitis is the most common of the skin issues affecting westies who are genetically predisposed to be hypersensitive to airborne or environmental allergens which can include moulds, pollens, dusts, and mites, including house dust and storage mites. Food allergies are common, and stress can be a factor. 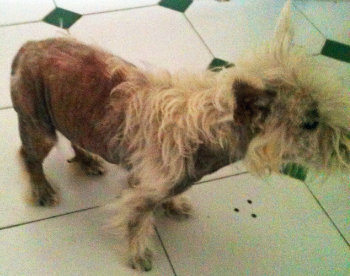 Most cases of Atopic Dermatitis manifest before the westie is 3 years old. If a skin problem presents after that age it is probably not due to Atopic Dermatitis, but another cause. Skin problems can cause your westie a lot of misery, and trying to find and eliminate the cause can be very frustrating for the owner. Atopic Dermatitis does not have a cure, but in most cases can be managed. Bacterial and yeast hypersensitivity can also be a problem in which case treatment with antibiotics is necessary to control any secondary infections. A natural diet is recommended, to avoid additives which may provoke an allergic response. Eliminating the use of carpet fresheners, air fresheners and other environmental triggers can do much to alleviate and prevent a problem. Early veterinary treatment is essential if the problem is to not take a hold and therefore become more difficult to manage. At Westie ReHoming we have treated and managed countless skin problems, some particularly nasty, with great success using a combination of conventional medicine, natural and complementary therapies and a healthy natural diet. This is a condition found mostly in the terrier breeds indigenous to Scotland and appears to be inherited. It is a painful condition usually occurring between 4 and 7 months of age which affects the lower jaw. The disease is an extraordinary growth in the cells of the bone where the mandible joins the skull and usually affects both sides of the jaw. It goes through stages of growth and rest and can only be confirmed by an X-Ray. Although painful it is treatable and cortisone is commonly used to control swelling. Homoeopathic remedies have been used too, with excellent results. This occurs as a result of a decreased production of tears causing the eye to become inflamed. Both eyes are usually affected, but not necessarily at the same time. First signs are excessive tackiness around the eyes which may become partly closed due to lack of lubrication. Certain factors are known to cause the condition, e.g. the use of certain drugs over a long period of time. It can also occur as the result of a hormone imbalance such as hypothyroidism which affects the immune system, and so it is wise to have the dog’s thyroid function checked. Treatment consists of lubrication several times a day throughout the dog’s lifetime, or surgery where the saliva gland is diverted from the corner of the mouth to the corner of the eye, the saliva providing a lubricant for the eye. Dry Eye is an immune related disease that can cause blindness if left untreated. However, with treatment the progression of the disease can be slowed or stopped altogether and sight can be protected. This affects terriers indigenous to Scotland as well as humans (not necessarily indigenous to Scotland!). This usually starts between 4 and 10 months, and is caused by a degeneration of the hip joint due to lack of blood supply to the head of the femur. Pain and lameness results and treatment consists of keeping the puppy on drugs to reduce inflammation until the bone re-calcifies. Occasionally surgery is necessary to remove a piece of bone, or even a total hip replacement, with excellent results. There is a genetic link again here although environmental factors can do much to create a problem. Care must be taken to avoid knocks or injuries, or over-exercise when the dog is young which could result in a lack of blood supply to the hip joint. Hydrotherapy will help to improve joint mobility after surgery. Dogs that have had Legge Perthes should not be bred from. One of the most cruel diseases to affect westies (although other terriers can develop it) and is becoming increasingly common is Idiopathic Pulmonary Fibrosis, otherwise known as Interstitial Pulmonary Fibrosis, or Westie Lung Disease. It is often misdiagnosed at first as bronchitis, and is progressive, there is no cure. It is very rarely diagnosed in the very early stages when it may be possible to slow down the progression, and more commonly affects middle aged to elderly dogs. IPF as the name suggests causes the normal healthy tissue in the lung to become fibrosed and lack elasticity, with resulting progressive lack of lung capacity. Excellent research is being done at Minnesota University in the States, but comparatively little is understood about it in UK. The latest treatments for IPF include cold laser therapy and a Flixovent inhaler which has had success in managing the condition. For owners of dogs affected by Westie Lung Disease there is an excellent Facebook group ‘Westie Lung Disease–IPF in USA (Treatments, Symptoms, Studies, Etc. )’ which we would highly recommend for advice and support.